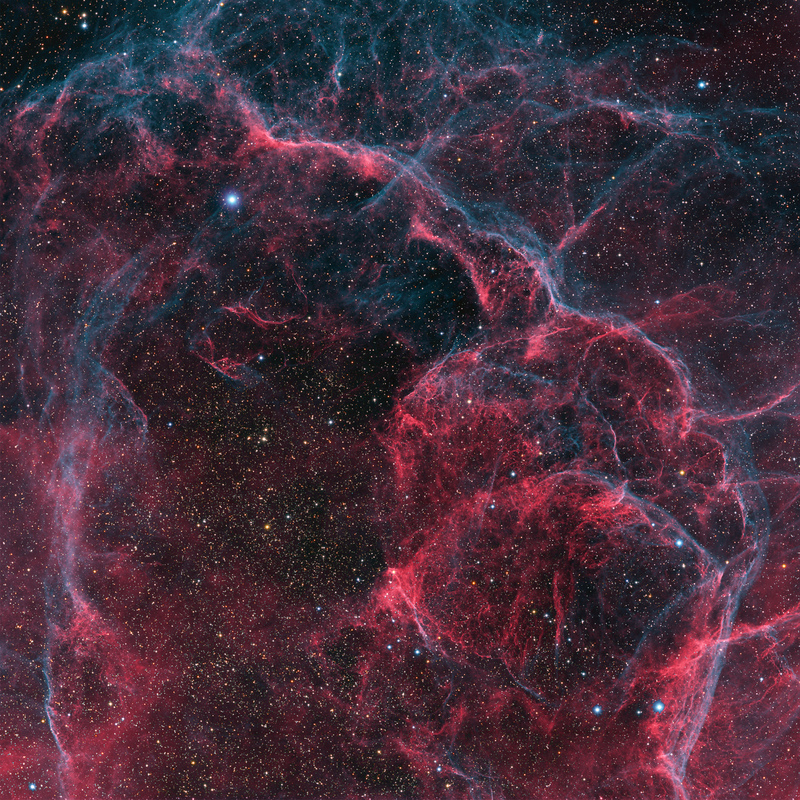 The Vela Supernova Remnant (SNR) is large structure encompassing 8 degrees in the southern constellation of Vela (The Sails) about 800 light years distant with a visual magnitude of about 12.� It is believed to result from a powerful explosion of a star some 11,000 -12,000 years ago.� The shock waves shown in the image as blue-green from oxygen emission and red/magenta from hydrogen emission have been expanding ever since.�� The Vela pulsar (PSR B0833-45) associated with this SNR is a neutron star that was formed when a massive star collapsed. It is 12 miles in diameter and rotates over 11 times per second. It is just off the bottom of the image.� The Pencil Nebula (NGC 2736 � see my image� here) is off to the lower left about 5 degrees away from the center of this image (at least one full image frame) and is still part of the Vela SNR, to provide some perspective of size. This image represents a 2.8 x 2.8 degree field. North is up and East is toward the left.� The Vela SNR is likely embedded in an older and much larger SNR, referred to as the Gum Nebula, that occurred over a million years ago. The enhanced structure in this image is a result of 17.5 hours of data from OIII and H-alpha narrowband filters with 3 nm bandpasses.� They were mapped to provide �natural� color, with H-a mapped to red/magenta and OIII mapped to blue-green.� 2 hours of RGB data based upon a G2V star white point were included for �natural� star colors.